Many houseplants are susceptible to indoor bugs and insects due to the lack of natural atmosphere indoors. There’s no wind to blow the pests away or rain to wash them off. Houseplants are totally reliant on their owners for protection for pests. The ability to recognize the most common pests ensures you can give correct treatment when it’s needed. Let’s look at some of the most common houseplant pests. Most of these pests can be controlled with sprays of insecticidal soap or neem oil. Products containing Bacillus thuringiensis (Bt) can help with worm or caterpillar problems. Commonly known as greenfly or blackfly, though they can be other colors such as pink and slate-blue, aphids are commonly found on indoor plants. 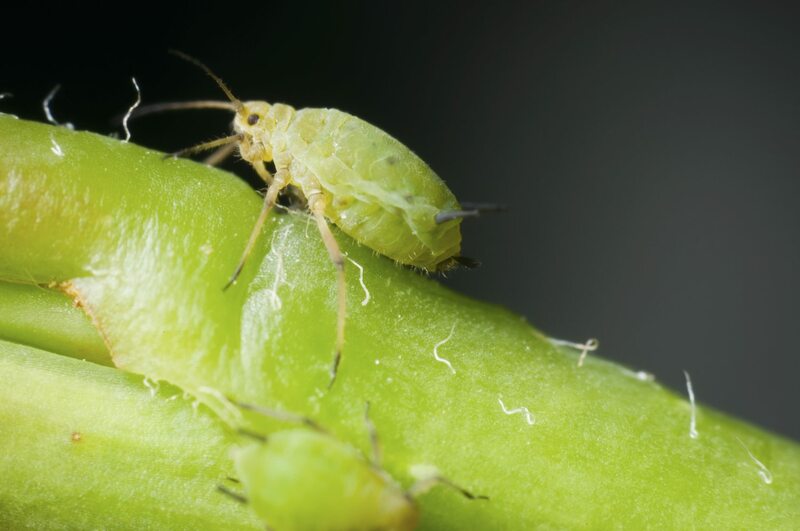 Aphids are able to reproduce without fertilization and will start reproducing within a week of birth if the plant is kept in warm conditions, so you can see how easy it is for an aphid colony to build up. Aphids feed by sucking the sap of plants. They are attracted to soft, young growing tips. When they eat, it debilitates the plant and spreads viral diseases from one plant to another. 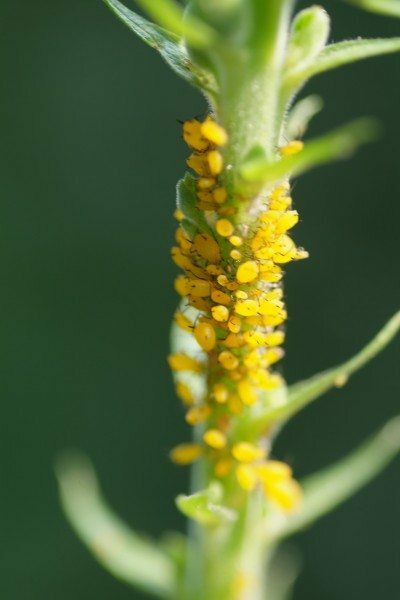 When the aphids excrete their sticky, sweet “honeydew,” the substance attracts a fungus called sooty mold. This grows on the honeydew to form black patches that can prevent the plant from photosynthesizing properly. Caterpillars affect plants, usually chewing holes in the leaves. Because this larval stage is the feeding stage, they have huge appetites and can do a lot of damage to one plant rather quickly. The carnation tortrix moth is a common culprit. These caterpillars are small yellowish-green caterpillars, usually found at the tips of shoots. They will form webbing, pulling the leaves of the plant together while they feed. Mealy bugs are usually found clustered in leaf axils and look like woodlice. They are covered in white, waxy fluff. These are a problem on cacti. They like to be around the base of the spines. Mealy bugs are sap suckers like aphids and can debilitate a plant quickly, secreting honeydew and attracting sooty mold. Red spider mites are scarcely visible to the naked eye, but they can be seen with a hand lens. They eat the sap, and the first symptom of an infested plant is yellow speckling of the foliage. The tips of shoots are usually covered with very fine webbing. The mites can sometimes be seen going backward and forward on the webs. These mites love dry conditions, the hotter the better. Plants can be really damaged as the mites multiply. They over winter in cracks and crannies around the plants, which makes it easy for this problem to continue from year to year. Scale insects are usually not noticed until they are a static gray or brown, limpet-like “scale.” They are attached to stems and the undersides of leaves. These, too, feed off sap. They also excrete honeydew, which means that the sooty mold is usually present in this type of infestation. These insects can sometimes be scraped off with a fingernail. With the vine weevil, it’s definitely the larvae that causes the problem. These larvae live in the compost and eat the roots of the plant. Usually, the first sign that the vine weevil is present is the collapse of the shoots and foliage. These pests love the cyclamen and will eat large portions of the tuber until it can no longer support the plant. The adult weevils, which are more active at night, will eat notches out of the edges of leaves. These pests cannot fly but will spend the day in plant debris at soil level. A tiny, white, moth-like creature called the whitefly can rise in clouds from badly infested plants. It can be real trouble to try to control. These bugs pass through a lot of stages in their life, but only the adult pest is susceptible to pesticides. Whiteflies are sap suckers like other pests. Therefore, there’s the issue of honeydew and sooty mold. Plants look less full of vigor, but whiteflies don’t completely seriously damage the whole plant. The mold can do more damage by reducing photosynthesis.